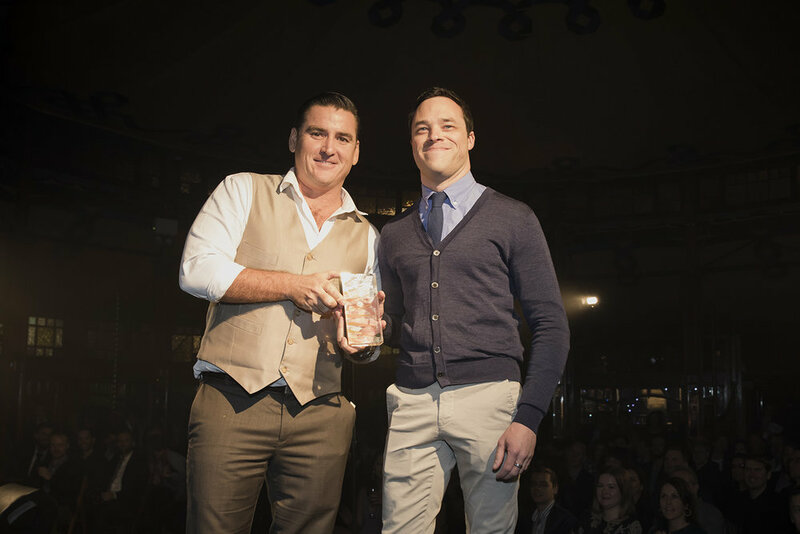 For back-to-back winner of the Sport category at the Australian Podcast Awards, the volumes of hard work and creativity that goes into By Association is a labour of love. James breaks down for us what has been inspiring him to create podcasts since 2011, and the gear and preparation that goes into an episode. All 2018 Australian Podcast Award winners taking a collective bow at the end of the awards ceremony. JAMES PARKINSON: I have been podcasting for about 8 years now. I began in 2011 with a show about Melbourne Victory. Then I produced The A-League Show for about three and a half years, before developing my current show By Association. It's been a fun journey! I'm constantly inspired by other independent podcasters who have grown their shows from nothing, through sheer hard work. Someone like Aaron Mahnke, creator of Lore is pretty inspirational. So much. As By Association is narrative, the production process is very involved. There's about 30 to 40 hours of work in each episode, sometimes more. This is partly because I'm doing everything myself, but also just because documentary storytelling is just time consuming. There's research, interviews, editing, writing scripts, recording narration, mixing and more. But I love the creative process. I have two setups. One for recording and producing at home, which includes any phone interviews, plus all the production work. Then I have a portable kit for doing interviews in the field. Home: Macbook Pro, Pro Tools editing software, Allen & Heath ZED14 mixer, TritonAudio FetHead preamp, Rode Procaster microphone, Rode PSA1 boom arm, Beyerdynamic DT770 Pro headphones. Portable: Zoom H5 digital recorder, Rode NTG-2 shotgun microphone, Sony MDR-7506 headphones. Well, for my show, it's everything! Naturally, production-heavy shows are more time consuming but in general, post-production will typically take the most time in almost all cases - as it should do. Even for a standard interview show, editing is so important, no matter how good your guest is! Take your time. Starting something new is exciting, but don't be too rushed to get your show out there, especially if you have never produced any audio content before. Do your research, know your equipment and practice a lot! You don't necessarily have to release everything you make, or at least right away. Do some practice runs, get feedback from people you trust and be patient. Please complete this sentence: "I feel most connected with my audience when..." They reach out unprompted to say how much the show resonates with them. It makes my day every time. This is Red Star, Tour of Duty, The Art of Football Commentary, The Anxiety of Football.